My husband and I love to go antiquing. He uses them as props in his photography and aesthetically, they appeal to him. These graniteware pots particularly sing little songs to his ears. 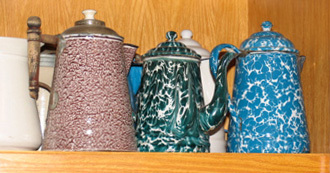 He loves it when he can locate graniteware with a different enamel finish than what he already owns. It’s fun to stop and look at the shops. Many are just junk shops, but others have all kinds of neat things. We’ve gotten better at identifying what things are and how they used to be used. But the most enjoyment is in the wandering and seeing where we end up. Word for tomorrow – BIAS. If you prefer to work ahead, see the list for the week under “A Word A Day”. Love this! Not sure if you knew but I’m an antiques dealer, albeit a part-timer. I sell because I love to collect. That’s really why dealers get into selling in the first place…too much accumulating at home. ha, ha. Because I’m in my 60s and am looking to simplifying life, I am trying very hard to weed out those things which are of least value, sentimentally. Not easy to be sure. But I don’t want to leave the task to my only child. I’m struggling to declutter the house right now – we never seem to have enough room for the things we own. I agree with you – so many things have no sentimental value and don’t need to be kept. When I’m tired though, it gets hard to make that distinction.